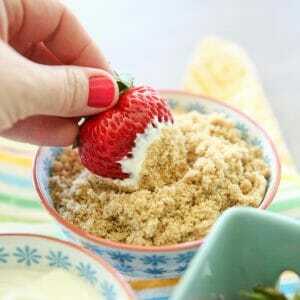 A deliciously simple combination of fresh strawberries, creamy sour cream, and sweet brown sugar. Place some sour cream in a small bowl, place some brown sugar in a separate small bowl. To serve, have people dip a berry in sour cream and then in brown sugar, and eat immediately! Tips: Use full fat sour cream and fresh brown sugar. Smaller berries work best if you don’t want your bowls to get messy from double dipping!